Anicius Manlius Severinus Boethius (480 – 524 or 525 C.E.) was a polymath and a Christian philosopher of the sixth century who was instrumental in transmitting classical Greek logic to medieval Latin scholars. Born into a high-ranking Christian Roman family and highly educated, he served as an official for the kingdom of the Ostrogoths but was later executed by King Theodoric the Great on suspicion of having conspired with the Byzantine Empire. His legacy includes textbooks on geometry, arithmetic, astronomy and music which were used throughout the Latin Middle Ages; commentaries on Aristotle, Porphyry and Cicero; essays on logic and four treatises applying logic to theological doctrines such as the Trinity and the relationship between God and Jesus Christ. Until the twelfth century, two of his translations were the only works of Aristotle available to Latin scholars. His most famous work, written in prison before his execution, is Consolation of Philosophy, which became one of the most influential philosophical books of medieval Europe and an inspiration for many later poets and authors. Anicius Manlius Severinus Boethius was born in Rome around 480 C.E. to the patrician family of Anicii, who had been Christians for almost a century. His father died soon after becoming consul in 487, leaving Boethius an orphan. He was brought up in the house of a devoted Christian, Quintus Aurelius Memmius Symmachus, who had been consul in 485; and later married Symmachus’ daughter Rusticiana. Scholars surmise that Boethius may have studied in Athens, because he was fluent in Greek and well acquainted with the works of the Greek philosophers, but there is no clear evidence for this. His education and intelligence set him apart, and he was employed by the Gothic king of Italy at Ravenna, Theodoric the Great, who commissioned him to design a water clock and also a sundial and gave him administrative responsibilities. By 507 he had received the title of “patrician” and in 510 he became consul. Two of his sons were simultaneously made consuls in 522. 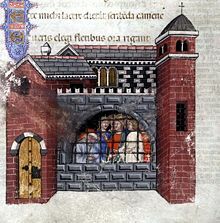 Boethius became Master of the Offices and it appears that his efforts to fight corruption in the government roused the anger of a few influential enemies in Ravenna. When Boethius defended the senator Albinus against charges that he had been in communication with Emperor Justin I of Constantine, a Christian, he was himself accused of treason and charged with sacrilege and the practice of magic. He was imprisoned at Pavia without being given a chance to defend himself, and was tortured and executed in 525. His father-in-law, Symmachus, who spoke out on his behalf, was executed soon afterward. While in prison, Boethius wrote Consolation of Philosophy, which later became one of the great books of medieval culture. Boethius, erudite and highly educated, lived in an era when Roman culture was dissipating under the rule of the Goths. He wrote on many subjects, and one of his intentions seems to have been to create educational materials to transmit classical Greek knowledge to Latin audiences. Several of his works were widely used as textbooks by medieval scholars. Boethius' philosophical works include translations, with commentaries, of Aristotle's logical treatises and of Porphyry's "Isagogue;" commentaries on Porphyry's Isagoge as translated by Marius Victorinus, and on Cicero's Topica; and several original essays on logic, De Categoricis Syllogismis, Introductio ad Syllogismos Categoricos, De Divisione (of doubtful authenticity), and De Differentiis Topicis. 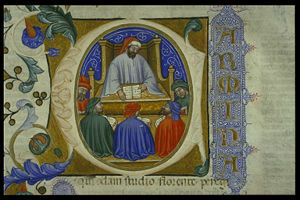 Boethius stated his intention to educate the West by translating all the works of Plato and Aristotle into Latin and adding commentaries; this effort was cut short, but his translations of Aristotle’s works on logic, together with his commentaries, remained the only works of Aristotle available to Latin scholars until the twelfth century. His commentary on the Isagoge by Porphyry, in which he discusses whether species are subsistent entities which would exist whether anyone thought of them, or whether they exist as ideas alone, underlay one of the most vocal controversies in medieval philosophy, the problem of universals. De Categoricis Syllogismis and Introductio ad Syllogismos Categoricos discussed categorical and hypothetical syllogisms. Boethius’ essays and commentaries became known collectively as the Logica vetus, and were studied by medieval scholars of logic. Many of his methods, definitions, and terms such as “person” and “eternity,” became standard in medieval schools. Boethius wrote four textbooks on mathematics and the theory of music, the De Institutione Arithmetic Libri II, De Institutione Music Libri V, Geometria Euclidis a Boethio in Latinum translate; and De Geometri, which is considered to be a ninth- or tenth-century elaboration of a work of Boethius. (This work contains evidence which helped determine the period in which Arabic numerals were first used in Western Europe.) De Institutione Arithmetic Libri II, and De Institutione Music Libri V, were based on the work of Nicomachus of Gerasa. These works were used as textbooks for the quadrivium, a medieval course of studies consisting of arithmetic, geometry, astronomy, and the theory of music. Five theological works of Boethius remain in existence, De Trinitate; two short treatises (opuscula) addressed to John the Deacon (who later became Pope John I); Liber contra Eutychen et Nestorium; and De Fide Catholica (some scholars question whether this was truly written by Boethius). Boethius observed the theological debates taking place between the churches of Rome and Constantinople, and applied logical analysis to clarify some of the points of doctrine. Liber contra Eutychen et Nestorium was apparently a response to a letter written by some Greek bishops around 513 C.E. proposing a new concept of Christ which they hoped could unite the Western and Eastern churches. Two treatises on the Trinity were directed at a group of Scythian monks who made a similar attempt in 519. Boethius used the techniques of Aristotelian logic to examine both the orthodox Christian doctrines and some of the heretical ideas being offered, (such as the views on Christ and human nature suggested by Eutyches and Nestorius) and pointed out logical contradictions in the heresies. He also attempted to apply Aristotelian classifications to the orthodox understanding of God. A number of glosses (for example, by scholars such as Johannes Scottus Eriugena and Remi of Auxerre) found in manuscripts dating back as early as the ninth century indicate that his treatises were widely studied during the early Middle Ages. 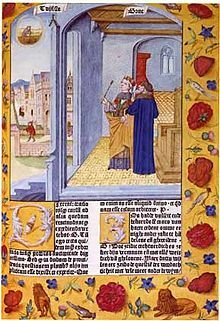 Boethius’ final work, Consolation of Philosophy, was written in prison as he awaited execution on charges of treason, without having been granted a trial or a chance to defend himself. Written as a Menippean satire, or prosimetrum (passages of prose interspersed with verse), it is a dialogue between Boethius and Philosophy, portrayed as a woman, and exemplifies Platonic ideas. Philosophy tries to console Boethius by arguing that true happiness cannot be affected by tragic material circumstances. The work discusses providence and fate, the nature of God, the origin of the universe, prescience, and predestination. It contains a famous definition of eternity as “perfect possession all at the same time of endless life.” Though not read by his contemporaries, the book was popularized during the ninth century by Alcuin at the court of Charlemagne, and was read not only in schools but by medieval laymen interested in philosophy. It was translated into Anglo-Saxon by King Alfred, and into later English by Chaucer and by Queen Elizabeth; many manuscripts survive and it was extensively edited, translated and printed throughout Europe from the late fifteenth century onwards. Its influence is evident in Beowulf and Chaucer, in Anglo-Norman and Provencal popular poetry, in early Italian poetry, and in Dante Alighieri’s Divina Commedia (The Divine Comedy). During the eighth century, Boethius was honored by many Catholics as a martyr and his feast was observed on October 23. It was believed that he had been executed for his devotion to the Catholic cause, which Emperor Justin I had been championing against the Arian King Theodoric. In 1883, the Sacred Congregation of Rites confirmed the custom prevailing in the Pavia diocese of honoring St. Severinus Boethius, on October 23. While it is clear the Boethius was a Christian, there is no clear evidence that he lost his life as a martyr for the Catholic faith. History of "Anicius Manlius Severinus Boethius"
This page was last modified on 22 March 2016, at 15:01.